Ok- I have been asked to write posts about Disney World numerous times. It’s like you guys know how much we love it and how often we go! This will be the first of several posts. I know that many people I know are heading down to see Mickey next week for winter break, so I thought now would be a good time to write just a basic overview of how we do Disney with our kids. Let me start by saying, that we do not do Disney like your typical family. We do not go from sun up to sun down with no break for several days in a row. Even if it is just Bryan and I going to Disney, we still do these exact same things. It makes it way more enjoyable for us! 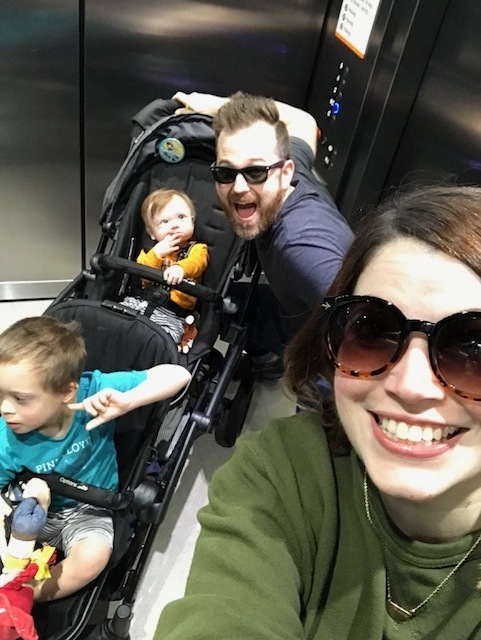 So without further ado, I will share some things to do, things not to do, and some tips if you are traveling with children with special needs. take/rent a stroller (comfy)- Just to warn you, Disney strollers are not comfortable. We rent from Kingdom strollers if we don’t have room to take our comfy double stroller for the kids. Kingdom strollers will drop off and pick up the stroller at your hotel if you are staying on property, or they will deliver to Kissimmee as well. We have had the best experiences with them. If you don’t have a good comfortable stroller, then consider renting one from kingdom strollers. Take snacks, drinks, etc.- We take a bag full of snacks and drinks for the kids. It’s a lot easier for Bryan and I to grab something in the park, but if your kids are already excited and possibly over stimulated then having familiar snacks and their regular water bottle makes all the difference in the world. Sometimes we even pack a lunch/dinner for Dex. Bryan and I can grab something on the go, but Dex likes having his old faithful for lunch, and then we can have a sit down meal sometime that day as well. Parent swap- Always take advantage of parent swap on rides that your kiddos don’t want to/ or are too short to ride. One parent waits in line, and when you get to the front of the line, tell them that you want to do the parent swap, and they will give you a tag to take back to the other parent who is waiting with the kids. They will go through the fastpass line and get to ride after you. So easy, and then you don’t miss out on any rides. Prepare them (youtube videos are great)- I make a playlist on youtube of the parades, inside the rides, restaurants, character interactions, etc. so Dex can watch them and know what to expect when they get there. I especially recommend this if it is your kid’s first time going to see the mouse! We love our double stroller! Expect to do everything- Don’t go into your day expecting to ride all the rides and see all the things. We set out with only 3 must-dos. Yes, you read that right. Three. Anything else is icing on the cake. Push your kids if they need a break- If your kids are showing signs of meltdowns, slow down, find a quiet place, or head back to the room for a bit. I promise, it will make a world of difference. Eat meals at off times- This is something we like to do to keep the crowds and noise down. We eat breakfast really early, or do a late brunch instead of breakfast and lunch. We will sometimes eat dinner at 4 pm, just to avoid crowds. Stroller pass- We always get the pass to use our stroller as a wheelchair. We can take the stroller in lines and restaurants, so that Dex feels like he has a safe place to hang out when he is having to wait, or when he gets overstimulated. This is a lifesaver. We get it every single time. Disability pass- Last time we were there we used the Disability pass. It was great! We went to a rider Dex wanted to ride, and they gave us a time to come back. Baby care center- If you need a quiet place to change your kiddo, then there are baby care centers in each of the parks. They are quiet and you can change your kiddo. We still take Dex in there when he has an accident rather than taking him into the big bathroom with a million stalls. Sensory toys- I make sure I take light up toys, blankets, slinkies, etc. in our bag. When Dex starts to get overstimulated, giving him something that is familiar and his to play with is so calming. It also keeps us from buying too much in the parks! Make a schedule- Dex LOVES schedules. I made a picture schedule last time we went so that he knew what was coming next. This was huge for him, and made me feel bad that I hadn’t made one earlier. It was so helpful to be able to use his first/ then statements to help him know what was coming next. If you have any specific questions about Disney with or without kids, good places to eat, or even help booking your trip! I would love to chat with you. I am no travel agent, but I have booked many many trips, and know how to find the deals, the good places, to eat, etc. Let me know if I can help you in any way!